Saari ussi lamhe main samaai hai. Toh wohi lamha khaara sa lagta hai. Phir bhi log sabse zyada isse hi barbaad karte hain. Posted on October 16, 2014 October 17, 2014 Categories UncategorizedLeave a comment on Only When..
Jisne unke jeevan main zeher ghol diya. Machliyon ke ghar ujad diye. Machliyon ke ghar ko kudedaan. Bahut maza aata hai tujhe Machliyon ka ghar tabah kar. Unhone bana liya hai Aasmaan aur Samundar ko apna yaar. Bandh kar de Prakriti ke saath yeh atyachaar. Posted on October 6, 2014 Categories UncategorizedTags Hindi, Insaan, Marine pollutionLeave a comment on Saavdhaan Insaan!!! An old man was on his deathbed. He saw the ultimate dream of his life, ‘A Garden Of Dreams’. A garden where all his dreams became potted plants. Some plants were totally ruined, some on the verge of drying up, while some bloomed beautifully. There was this plant of little hockey sticks which completely withered devoid of proper care. A plant which he planted with his wife, a beautiful daughter was on the verge of drying up as a weed called ego snatched away all nutrients from that plant. There was a MONEY plant which was fully nurtured, but it was least of his concerns now. Out of nowhere, he saw two golden butterflies, as he chased them down, he reached to the end of his garden. He saw innumerable garden of dreams there. He saw a poor kid sowing few ‘Cricket Bat’ seeds, then he saw a blind girl planting a sapling of musical notes and it went on and on. After giving a thought, he ran to his own garden and uprooted a single root from his proudly blooming money plant and planted it in the kid’s garden. He repeated this action till the last root of his money plant was left. He was relieved. After all this hard work, when he reached his own garden, he was confused. All the plants that were on the verge of dying were blooming beautifully. He sat on a bench enjoying the beauty of this moment. The two butterflies which he chased earlier transformed into his last wish, a vipin and he started playing a beautiful symphony. Revenge begets Revenge. Haider is not just a film, it is a painting done on the landscape of Kashmir. Based on William Shakespeare’s Hamlet this art piece exposes the reality of the Valley on the backdrop of Family rivalry. Vishal Bhardawaj, the painter has used perfect combination of his colours, be it the music, the dialogues or the direction. The background score works as a catalyst to keep the audience at the edge of their seats. But what takes my breath away are the characters painted in it. Whether it is Haider (Shahid Kapoor), Khurram (Kay Kay Memon), Ghazala (Tabu) or Arshia (Shraddha Kapoor). The special appearances by Roohtaar (Irffan) or Dr. Hussain Meer (Narendra Jha) were also powerful. The family rivalry is a subtext to the situation in Kashmir, the tussle between the Army and the Militants in which the common people of Kashmir are the biggest loser. 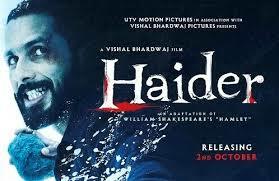 Haider shows the warmth that common people of Kashmir have even after going through a lot of pain. Kashmiris have lost their loved ones, who are either killed in fake encounters by Army or brainwashed by Militant groups across the border. also gets a special mention for his sheer brilliance in cinematography. At last, If the jealous and corrupt Censor Board Of India had not made 42 cuts, this nearly perfect masterpiece would have been perfect.